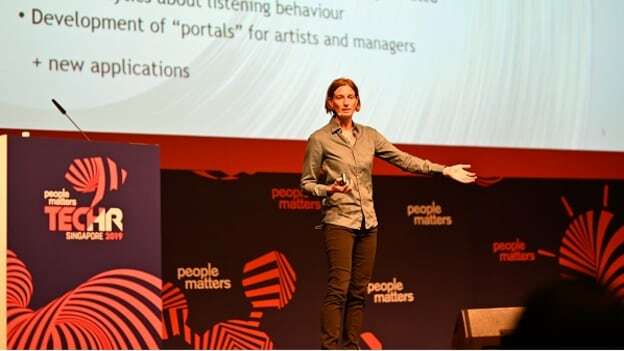 In a session at TechHR 2019 Singapore, Dorien Herremans from Singapore University of Technology and Design shared insights from emerging research about how artificial intelligence technologies are changing the music business. Over the last few years, there’s been a steady growth in revenue from digital music. In just six years, revenue from music streaming moved from zero to 40 percent of the overall global recorded music industry revenues, according to a report by IFPI. With revenues to the tune of 9.4 bn dollars a year, the digital model is only set to grow. There are no easy answers to the question. Traditional recording companies are already making a pivot, says Dorien Herremans, an Assistant Professor at SUTD. She notes that a number of companies now employ big teams of software engineers, not just to work with streaming music sites, they also need to be able to protect their mp3 and therefore need experts in cyber security. And AI is offering new and interesting possibilities in generating and disbursing music itself. Dorien spoke about three areas where the use of AI is being studied. AI based algorithms leverage genre preferences, and social media profiles of the user to recommend new music. There’s a strong correlation between music and emotion, says Dorien. When listening to music, one is often listening to a certain emotion. An annotated emotions dataset can be used to help predict music recommendations. It’s estimated that 40 percent of people listen to music while engaged in their work. In countries like Mexico, it is as high as 68 percent. One way this technology can be leveraged is by identifying music that can stimulate employees. It can also be used to identify emotions that employees maybe going through. In the music business, there’s a lot riding on the success of hit singles. The cost of breaking a single is estimated to be around $500,000 to 2 million. A study of the datasets on singles from 1985 to 2013, revealed that music preferences change. Over time, the songs get shorter, and louder. Researchers used this data to create data science models to predict if a particular song would top the charts. The model, according to Dorien predicted the right songs with 80 percent accuracy for dance music. Music preferences are also influenced by peers. Data models are advancing at a pace where they can predict the next week's top songs. This is done by leveraging social media features to understand which songs will be a hit in the next week, based on what people are listening to today. A third area where AI is being leveraged is to create music itself. “Music is more than a sum of its parts” Dorien says, explaining that generating music is hard. There are two main problems: 1) Music and emotion are strongly related. And computers aren’t good at feeling emotion. And 2) when we like a song, it’s usually something that sticks to our mind. And computers aren’t equipped to deal with long tem structures and often rely on song templates. Nevertheless, a handful of startups are producing simple background music. While the business of music is disrupted, there are a number of emerging AI based tools that are going to help inform music creation. And it’s not just machine learning inputs, but a musician’s informed inputs that are going to define the future of music. NEXT STORY: Are you co-working the right way?